Help us celebrate National Donut day, Friday June 7th, with an extra sweet event! In conjunction with Wilmington Donut DAZE, a two-day festival celebrating the deliciousness and fun of the DONUT, we are hosting our fourth annual Donut Crawl! Who doesn’t love donuts?!? And this is the perfect place to do it – within a one-hour radius we have over two dozen different independently owned and operated donut shops! Again this year, we have 15 different shops joining us in our event. You can choose a Creep, a Crawl, or a Coma, depending on how many donuts you wish to try. Each shop will be represented by a carefully chosen donut, giving you a wide variety. We are beyond excited! Here’s how it will work. Starting at 5:00, come to the registration table and pick up your bakery box and mug. Then move from station to station, collecting one donut from each of your designated bakeries. Eat them, or put them in your box for later. It’s totally your choice. We’re also being joined by Mugsies Coffee House and Windy Ridge Dairy so hold out that mug for a drink to enjoy with your donuts! Tickets will be very limited the evening of the event, so make sure to pre-register by May 15th in order to guarantee a spot in the crawl. For a list of participating shops and a pdf registration to print and mail, visit our Donut Crawl page. *** Creep participants will receive 5 full donuts (one donut from 5 different donut shops) and a mug for one drink. 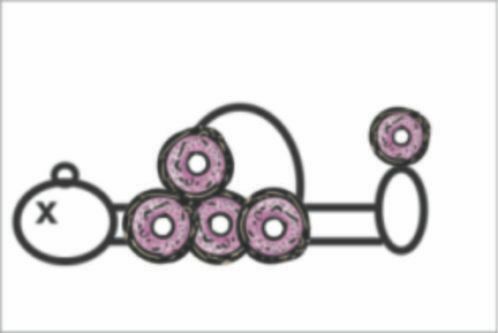 Crawl participants will receive 10 full donuts (one donut from 10 different donut shops) and a mug for one drink. Coma participants will receive 15 full donuts (one donut from all 15 different donut shops) and two mugs for one drink each. Unfortunately we cannot offer rainchecks or refunds if participant cannot attend, but you can send a friend to pick up your goodies the night of the crawl. Due to the volume of people we are expecting, we cannot swap out coffee for lemonade for milk. Please decide prior to purchasing your ticket which drink you want. We also cannot swap out donuts. You will get donuts from the shops as listed below. In case of rain, don’t forget your slicker and boots! We’re crawling regardless of weather. Please note: last minute donut shop substitutions may occur in case of unexpected hiccups.